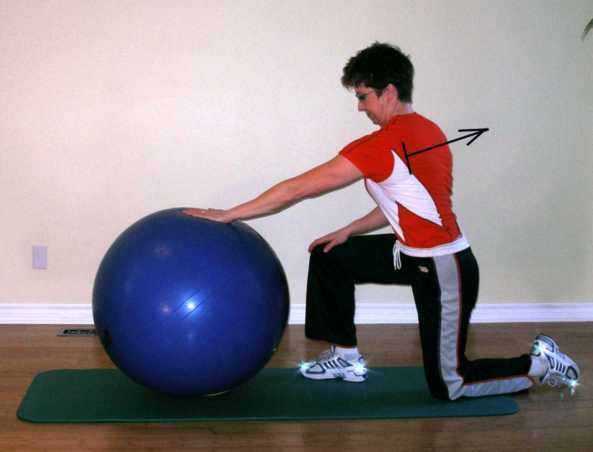 Start this exercise ball exercise by kneeling in front of the ball. Put your hand on the ball face down such that your shoulder and hand are roughly at the same level. You may need to place the ball on a stool or table to achieve this. While keeping your arm straight pull your shoulder blade back and down. Then without moving your trunk, push the ball forward. You should feel your shoulder blade move forward on your rib cage. Maintain a downward pressure on the ball at all times. This is a small movement. There should be no trunk flexion or rotation and no elbow bending. Part of what this exercise should do is help you become aware of your posture. This exercise helps improve shoulder range of motion, stability, and posture. Try Wax on, Wax off. This is a good exercise if you are just beginning a scapular stabilization program. Poor scapular mechanics often contribute to shoulder pain. use this exercise to become aware of where your shoulder blade sits on your body. Click here for more exercises for posture.